Being fifty-something, I’m thinking more and more about where my food is grown, how it’s grown and what happens to it on its way to our fridge. We’ve been exploring farmers markets and loving what we see … and taste! On Sunday we ventured to the new Geelong Makers and Growers Market in the grounds of historic Osborne House at North Geelong. What a setting! Even on a chilly, blustery morning, the grass-carpeted locale overlooking Corio Bay was spectacular. This market is in its infancy. We caught up with it at its third ever outing and had been warned that stallholder numbers were in growth phase. Despite being deep in winter-dom there were a dozen or so stalls and a throng of resilient, rugged-up stallkeepers holding their cheer. Some familiar faces. Some brand-new-to-us crafters and growers. We were delighted to find an old favourite La Bassine, a Surf Coast maker of preserves. 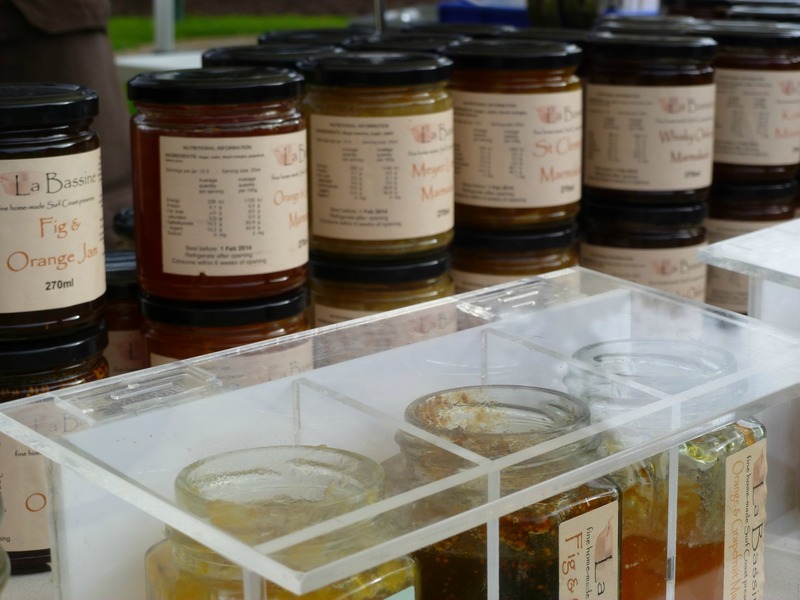 After much tasting to split our love-it-lots and must-haves we settled on Pear and Vanilla Jam and Fig and Orange Jam. Lip-smacking! 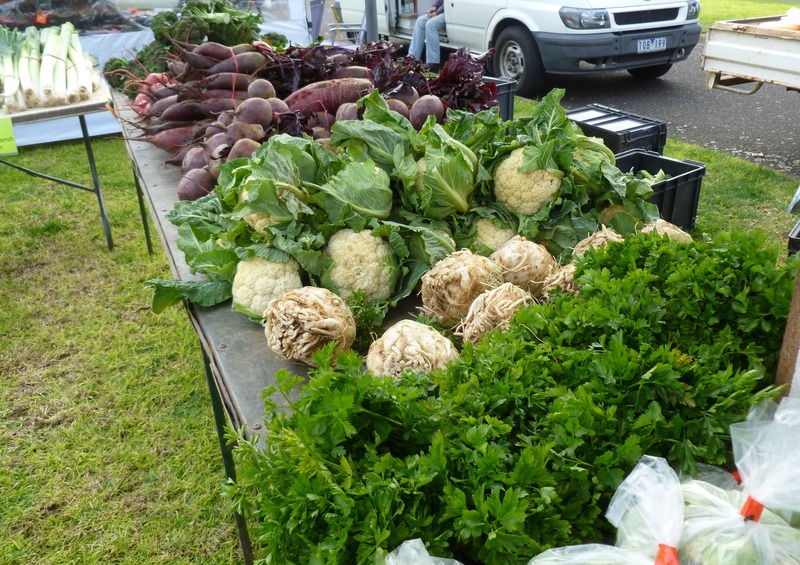 Over at the Spring Creek Organics stall we found all sorts of new delights. 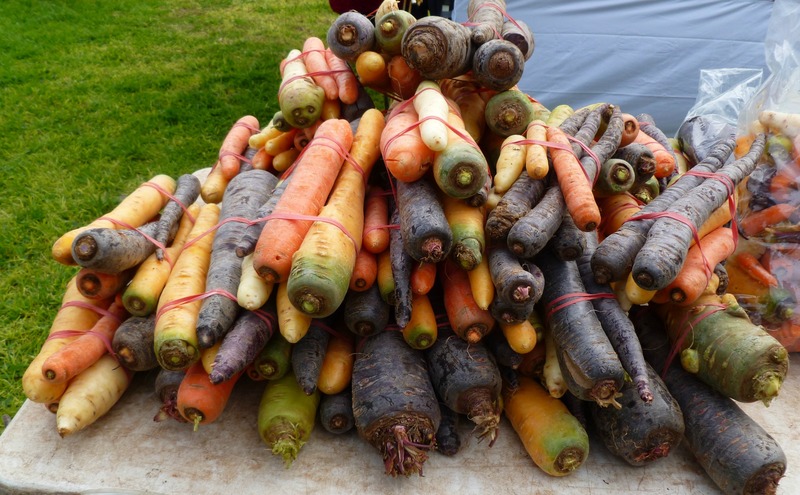 There were multi-coloured heirloom carrots – of interest to me who’d been reading about how all carrots were purple until we (yes, people) developed the aesthetically appealing orange variety, the ones readily available in supermarkets. We chose a huge bag of mixed carrots, big and small, orange, purple and yellow, some broken, some whole. I couldn’t resist the leeks – much more inviting than the straggly, skinny few that I seem to resort to at the supermarket. 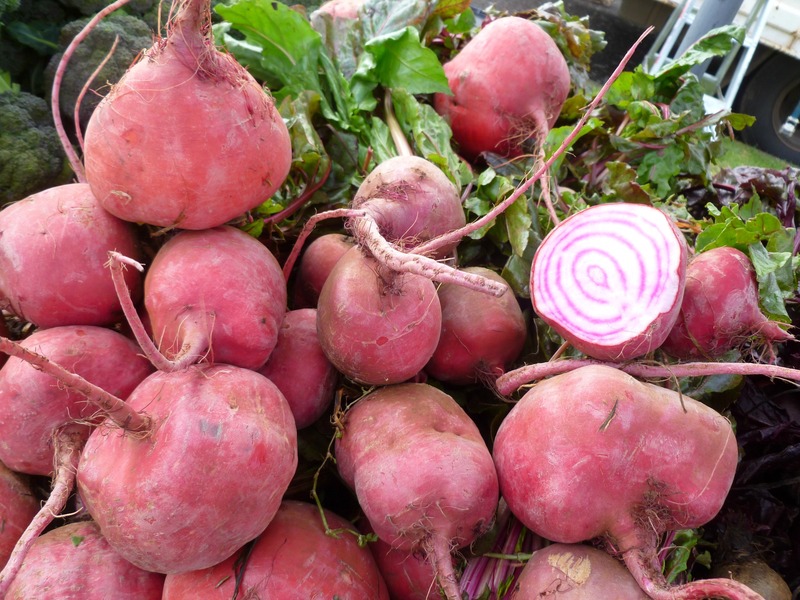 Then I discovered chioggia beets. I initially thought these were radishes on steroids. The stallholder explained exactly what they were (from the beetroot family) and sliced one open to show me the pretty red and white rings inside. He carved off a slice and offered a taste. He wasn’t surprised one bit when I was surprised by the sweetness. He explained how to use/cook with chioggia beets. I was hooked. That’s what I love about these markets … interacting with the growers and growing my food knowledge. I have a whole new veggie vocabulary happening. We ended up with quite a stash of fresh tucker including a brown paper bag-full of organic spuds, free range eggs and some lemon relish made by the lovely ladies on the Daffodil Day Stall. The spuds and leeks went straight into the slow cooker (Potato and Leek Soup for dinner and then lunch). We roasted off more spuds and a third of the carrots, drizzled in olive oil and fresh herbs from the garden in a side dish that even Jamie Oliver would be chuffed about. Organic and seasonal really does taste incredibly better! It’s worth paying that little bit more for. Preheat the oven to 375°. Place the beets into a bowl and toss with melted coconut oil and a pinch of sea salt. 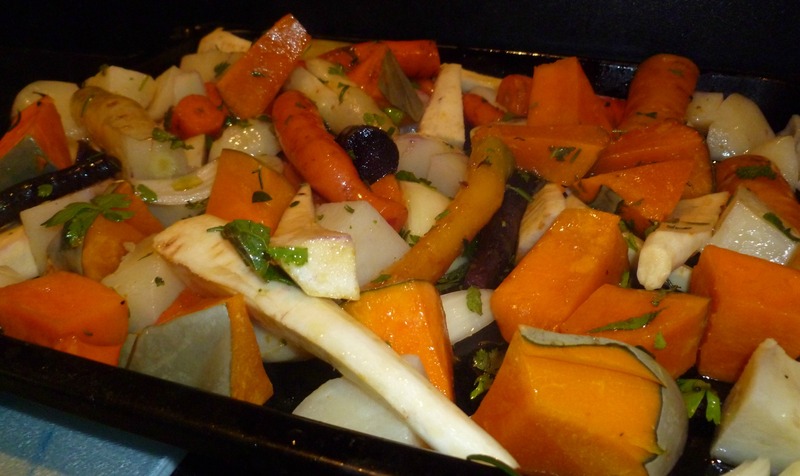 Place on a pre-greased baking sheet and bake for 20-30 minutes, turning once or twice to ensure even cooking. Serve in place of potato fries with a burger and side salad. 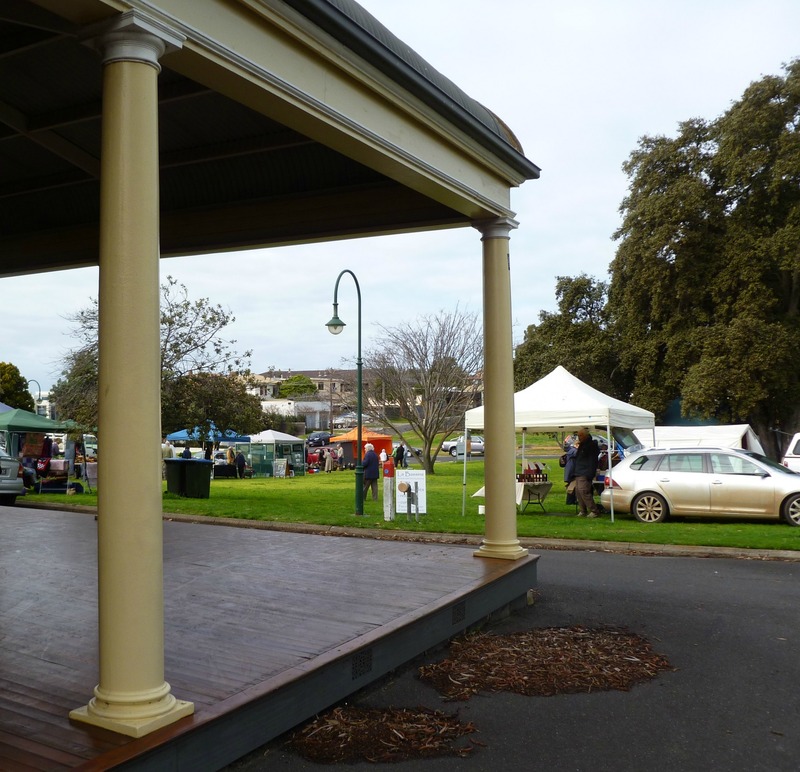 If you’re in or around Geelong, I can recommend a visit to the Geelong Makers and Growers Market, held every third Sunday of the month, from 9am to 1pm, at Osborne House, North Geelong. 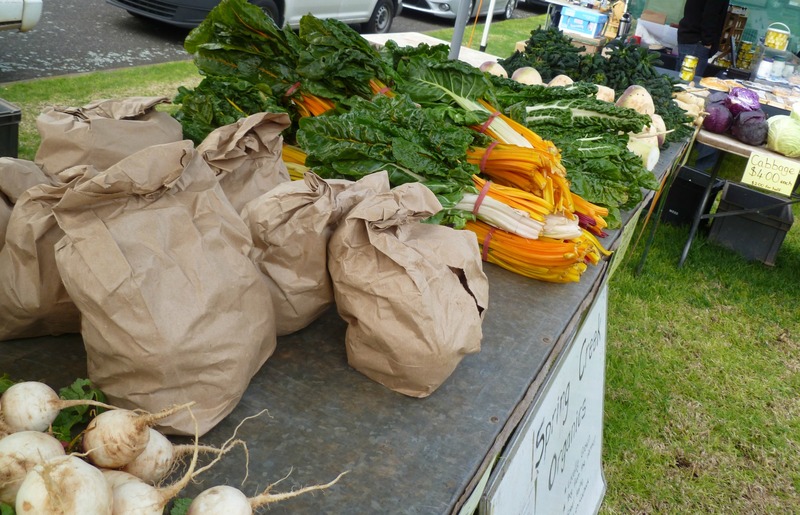 I’m confident this market will grow and grow, helping fill the calendar of Geelong markets so we can readily shop fresh, seasonal, organic and direct every week. I predict that by summer, this market will be pumping. The more we support these initiatives, the faster they’ll grow. Cheers and Chioggia to you. Previous Post Incubating the nest egg. My way. Next Post Falling in love with our house. ALL over again. Lovely post, and the photos are really inspiring me to get out to our local farmers’ markets ASAP!